The following is a guest post by Brad Luna, founding partner of LUNA+EISENLA media, a strategic media communications company based in Washington, DC.. This article was originally posted on LinkedIn Pulse. Pulling off a successful conference or annual meeting is a major feat for most organizations. While meeting planners often pray for a few tiny miracles, what it really takes are long-hours, exhaustive research and meticulous planning. After all, significant amounts of organizational resources, including financial and staff time, go into producing an event important to the overall strategic goals of the association. For many organizations a conference or annual meeting is also the time for big announcements that can impact supporters, members or the general public. Delivering these “mission critical” messages to the public and stakeholders in legislative chambers or boardrooms across the country takes media coverage – but first you have to entice them to find your event newsworthy! Engage Your Public Relations Strategists Early in the Planning Process – Oftentimes its only after the keynote speaker is booked, the hotel ballroom is reserved and the final program is printed that conference organizers think to bring in the communications team. To make the most of your conference or meeting you should involve your association’s public relations team in the conference planning process. Bringing them in too late in the game could spell disaster for attracting quality media attention around the big day. It is wise to remember the elements that go into planning a successful conference for your attendees are not always the same elements needed to make it press-worthy. By bringing in your communications team or public relations strategists, you will also ensure an event is structured to maximize potential media attention. Provide the Media with “Entry Points” into the Conference – The truth is in today’s fast-paced, 24-hour news environment, reporters oftentimes don’t have the luxury to sit through a days worth of meetings, much less two or three. Provide the media with easily accessible “entry points” into your conference by organizing content-rich and newsworthy panelists into one and two hour blocks of time. Guiding media to a specific portion of the event will allow you to drive media to speeches and panels most appropriate for the news coverage you want to get your message out. Organize Your Conference Around a “Call to Action” or Release – Whether it’s a public policy initiative, industry roll-out or release of a new study and/or white paper, pre-planning to allow the conference to coincide (or include) an announcement helps raise the news value of the entire event. Pairing your conference with a timely “call to action” or release will help drive media attention and empower your conference’s messaging with action. 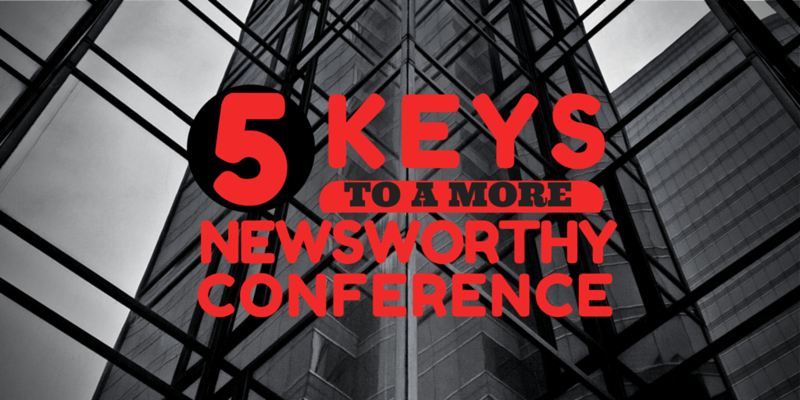 Connect Your Conference’s Message to Current News Narratives – Your conference may be showcasing incredibly interesting content and discussion, but for the media to be interested there needs to be an element of relevancy to current news narratives. Engaging seasoned public relations professionals early in the planning process will help you find the right way to package your conference messaging and materials for the media’s consumption. Arranging in advance for time to have your panelists or keynote speaker available to the media will also be important. Will your message or messenger be able to get on television? Will you want to pre-arrange a time to visit a local TV studio? Create a Media Friendly Environment to Foster Positive Relationships after the Conference – When planning for the day-of meeting, it is the PR team that can help you look at the conference experience not only from the attendees point of view but also from the eyes of the media you hope to attract. When media arrive at the event, provide a media check-in area and for on-site press staff to greet them and immediately give them the “run-of-show” or schedule of the day’s events. In addition to ensuring they have the access they require to additional resources during the conference, consider following-up with them in the days after to continue to build on the relationship. This friendly environment will both help the coverage of your conference and increase the long-term credibility of your association’s brand as a trusted source for reporters. An added bonus, you will have someone already on your media list to invite to your next conference! Organizations both large and small spend significant amounts of time and effort putting together conferences to share ideas, connect industry thought-leaders and exchange lessons learned. Conference planners and organizers spend hours in meetings strategizing the best experience for conference attendees. It’s their job to think about the “conference experience” from the eyes of those in attendance, but public relations professionals and media strategists can bring an important prospective or eye to the conference’s “other” audience – the media. Truth is, there is no silver bullet to ensuring successful media attention for a meeting or conference, but there are certainly ways to increase your visibility on game day – and that preparation starts well before the meeting begins.